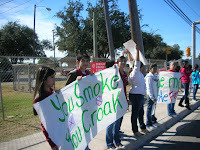 Ringgold Middle School Student Council and students participate in the Great America Smoke-out Day on Thursday, Nov. 18, 2010. The goal of this event is to promote a non smoking environment in our community. Tobacco-related diseases are some of the biggest killers in the world today and is one of the biggest causes of premature death. In the United States about 500,000 deaths per year are attributed to smoking-related diseases.